Jogindra Central Cooperative Bank Limited, Himachal Pradesh JCCB has released notification for JCCB Executive Officer Recruitment 2018 for 20 Post Vacancies. So, who are eligible and interested can apply for JCCB Executive Officer Recruitment 2018. Here we will provide complete details of JCCB Executive Officer Recruitment Notification 2018 in the following sessions. Also, check eligibility criteria for JCCB Executive Officer Recruitment like Age limit, Educational qualifications, JCCB Executive Officer Selection process etc, in the below sessions. The vacancies list for JCCB Executive Officer Recruitment has been given in the above table. Hence, candidates can apply for the different post as per their reference. Above all details are for the JCCB Executive Officer Exam and candidates can refer to this. Here, we also provide JCCB Executive Officer Syllabus and Exam pattern for the aspirants who are preparing for JCCB Executive OfficerRecruitment 2018. So, we suggest candidates start the JCCB Executive Officer Exam preparation as early as possible. The important Dates for JCCB Executive Officer Exam is given in the above table. Hence, candidates must apply before 22nd August for the Recruitment. JCCB Executive Officer Details will allow you to plan accordingly. Educational Qualifications 10+2 or its equivalent qualification from any recognized board from the recognized university. Age Relaxation: – For SC/ST 5 years and Ex-Servicemen state Govt Rules Regulation. Candidates will be selected based on Examination, Document Verification and Interview. 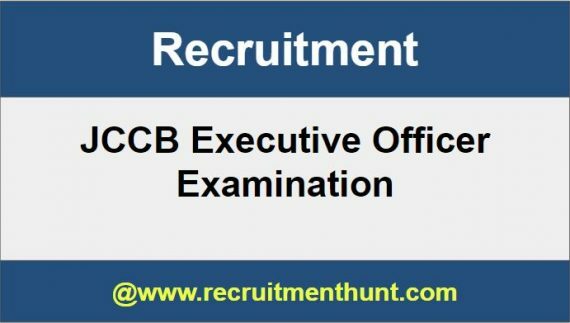 Search for JCCB Executive Officer Recruitment 2018 Notification. Download JCCB Executive Officer Himachal Pradesh PGT Notification 2018. Read the JCCB Executive Offer Recruitment requirements carefully. Download the JCCB Executive Officer Online Application Form. Fill the JCCB Executive Officer Application Form with necessary details. Recheck the JCCB Executive Officer Application form and send it to the following address before the last date along with the supporting documents.